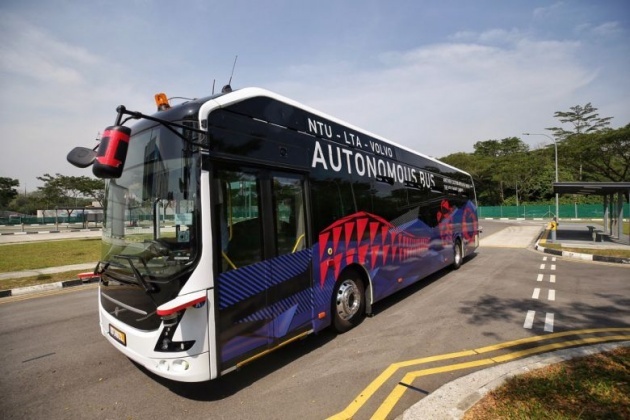 NTU and Swedish firm Volvo have launched an autonomous electric bus in Singapore. The bus, which can fit about 80 people, has gone through multiple tests at the Centre of Excellence for Testing and Research of Autonomous Vehicles - NTU (Cetran), and is now ready for tests in actual traffic conditions. It is able to travel 25km on a full charge. Through a 300kW fast charge system from engineering giant ABB, the bus can be charged to full capacity within six minutes. At an event unveiling the bus on Tuesday (March 5) at Cetran, NTU president Subra Suresh said: "This fully autonomous electric bus will play a role in shaping the future of public transportation that is safe, efficient, reliable and comfortable for all commuters. "This research project not only involves cutting-edge science, technology and artificial intelligence, but is also an excellent example of close partnership among academia, industry and government agencies in translating basic research into products and services for the benefit of Singapore and beyond."